También emitimos dos declaraciones de solidaridad con mobilizaciones en Ecuador y Uruguay que tuvieron lugar simultáneamente con nuestra Reunión. Ecuador is right now a key place for the study of some of the most recent initiatives taken to reconsider the role of the State in the government and management of water. The process leading to the new Constitution in 2008 recognized the right to water, limited the participation of private enterprise in the provision of water services, re-established public companies, created a single national water authority, and recognized community water management arrangements and the rights of nature. Ecuador has also headed the rejection of international arbitration for disputes between private companies and national states and some of the proposals for regional integration within the framework of the Union of South American Nations (UNASUR), which has its headquarters in Quito. What kind of balance can we make in 2013 concerning these initiatives, which have been termed ‘post-neoliberal’? What challenges and advances can we identify? How do these initiatives compare with others in the region? What kind of theoretical and methodological challenges we face for the study of these processes? 1. Are we moving towards a post-neoliberal hydrosocial metabolism in Latin America? a. Revisiting the notion of water “neoliberalism” (forms, indicators, levels; liberalisms and neoliberalisms; continuities and ruptures, etc.). b. Capitalist autonomies and heteronomies in Latin America; degrees of “de-neoliberalization”; neoliberal persistence and resistance (neoliberal islands in a post-neoliberal landscape?). c. Obstacles and opportunities for strengthening a post-neoliberal hydrosocial metabolism in Latin America. d. Post-neoliberal water government and management; the “buen vivir” and the rights of nature (contradictions, struggles, and challenges to the establishment of these rights and principles, etc.). e. The reproduction and construction of democratic post- and non-neoliberal hydrosocial territories (basins, transboundary waters; class, gender, and ethnic inequalities, etc.). f. Preserving and constructing democratic post- and non-neoliberal hydrosocial cultures. a. Revisiting the tension between social and environmental justice in the context of post-neoliberal capitalisms. b. Mega projects of hydraulic infrastructures with impact on the hydrosocial metabolism. d. Industrial and exports agriculture. e. The expression of tensions and contradictions in the health dimension (public health, environmental health, etc.). f. “Natural disasters”: injustice, inequality and defencelessness in post-neoliberal contexts. g. Confronting water injustice, inequality and defencelessness (struggles, contradictions, alliances, direction of the processes, etc.). 3. Recovering and defending the public role in the provision of essential water services (drinking water, sanitation, drainage, etc.). a. The challenge of guaranteeing the exercise of the human right to water. b. Challenges facing the interaction between community and public water management. c. Inequality and injustice in the post-neoliberal government and management of essential water services. d. Commodification and privatization of water and water services in the post-neoliberal stage (including the mercantilization of public companies, the consolidation and emergence of regional multinational companies [“multi-latinas”], etc.). a. Deepening interdisciplinarity in research: obstacles, opportunities, examples. b. Practicing trans-disciplinarity: research and action to democratize water government and management. c. The interrelation between academics, “non-academics”, and other actors of X-disciplinarity. 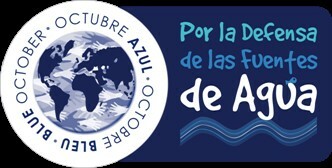 The meeting supported the Blue October Campaign against the control and commodification of water by private corporations. The Meeting was an activity of the WATERLAT Network. It was co-organized by the School of Geography, Politics and Sociology, Newcastle University, UK, and the Institute of Higher National Studies (IAEN), Ecuador. The organization of the event was supported by the Yaku Water Museum, Ecuador.